A culturally rich and authentic neighbourhood, Commercial Drive – also known as The Drive – is one of the best and most colourful shopping, dining and nightlife districts you will find in the city; and boasts home to Vancouver’s own 8 block Little Italy, representing more than 60 years of Italian heritage. Day or evening, The Drive offers 22 full blocks to explore with over 300 distinct merchants, including quaint boutiques, an eclectic collection of restaurants, a vibrant live music and bar scene, dinner and dancing, theatres, coffee houses, specialty food stores and bakeries. A one of a kind experience. Welcome to The Drive. Famoso Neapolitan Pizzeria on The Drive serves fresh, authentic Neapolitan Pizza. What makes a Neapolitan Pizza you ask? Caputo flour and tomatoes imported straight from Italy combined with fresh ingredients form a beautiful pizza that is cooked at 900 F for 90 seconds in a bell oven! Go to Famoso to pick up your recipe card for one stamp. Famoso is located at: 1380 Commercial Drive. 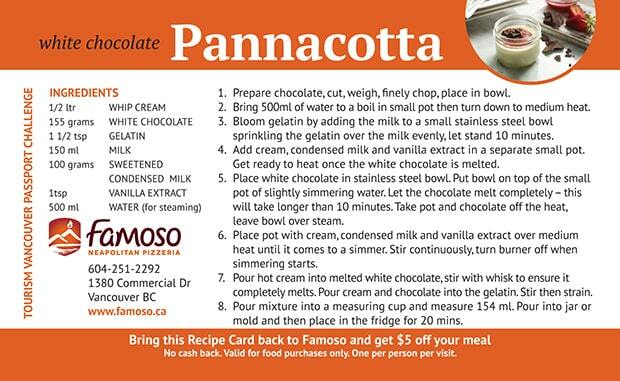 Offer: Bring this Recipe Card back to Famoso and get $5 off your meal! 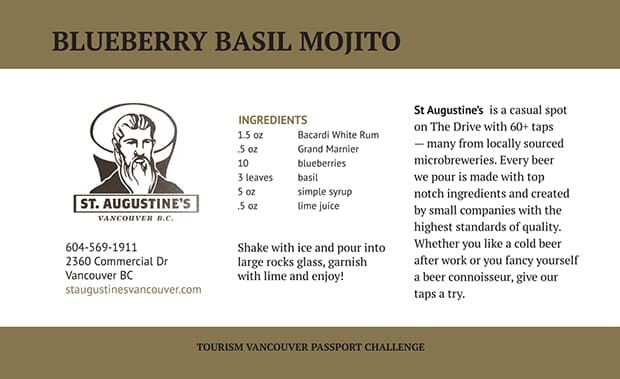 St Augustines is a casual spot on The Drive with 60+ taps — many from locally sourced microbreweries. Every beer we pour is made with top notch ingredients and created by small companies with the highest standards of quality. Whether you like a cold beer after work or you fancy yourself a beer connoisseur, give our taps a try. 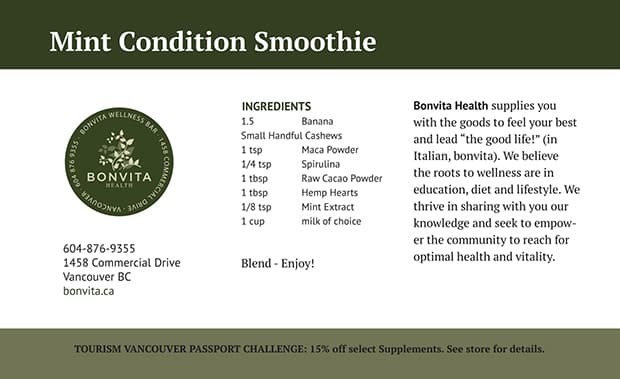 Bonvita Health supplies you with the goods to feel your best and lead “the good life!” (in italian, bonvita). We believe the roots to wellness are in education, diet and lifestyle. We thrive in sharing with you our knowledge and seek to empower the community to reach for optimal health and vitality. 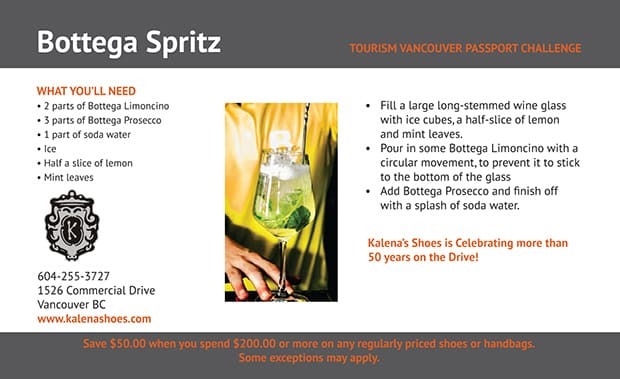 Kalena’s Italian Shoes & Accessories first opened its doors on Commercial Drive in the heart of Vancouver’s Little Italy in 1967. KALENA’S offers high fashion, exceptional quality, Italy Leather Footwear and Handbags for men and women. Exclusive styles, excellent selection, along with warm, personalized, service is what make’s KALENA’S unique. 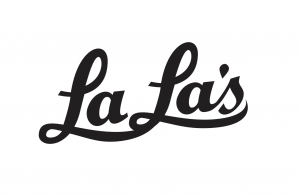 Go to KALENA’S and pick up your recipe card for one stamp. Come in and smell the leather at 1526 Commercial Drive.